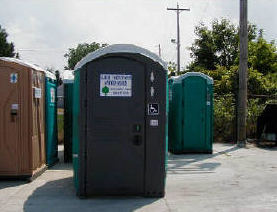 Portable toilets: All of our portable toilets are clean and functional. We know it’s rarely anyone’s first choice to use a Porta Potty, but we also know people are happy to see them when they need them. 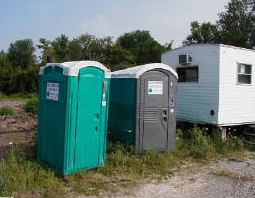 Fortunately, if you’re going to use a portable toilet in Sandusky, OH, then Garner Sanitation Services Inc. is your most consistent and dependable choice. 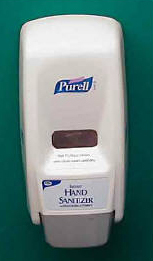 Additionally, you’ll find a Purell hand sanitizer dispenser in each unit for maximum hygiene and comfort. Sinks: Our sinks all come with two hand washing stations, a paper towel dispenser and an attached trash container. Give your loved ones and guests peace of mind by providing only the best hand washing units, provided by Garner Sanitation Services Inc.
Special features: We also offer special spacious handicapped-accessible units that are fully ADA compliant to ensure that all of your guests feel comfortable and accommodated. We also offer units with baby changing stations inside, so that your picnic or family reunion will be welcome to all ages. Warehouse Space for Rent in Sandusky, OH: Garner Sanitation Services Inc. is pleased to offer warehouse space for rent to customers in the Sandusky, OH area. Call today to ask about our current availability, like the newly available commercial warehouse space pictured below. For outstanding sanitation products in Sandusky, OH, we hope you know that you can always count on Garner Sanitation Services Inc. Give us a call today at 419-625-8764 for more information.